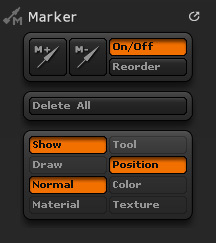 The Marker palette controls how markers function. Markers record the position, size and orientation of 3D objects. 3D objects placed on the canvas become converted to pixols, and can’t be transformed or edited after another tool or object has been applied. However, marking provides a way to recall an object later so you can draw it anew and transform or edit it. When an object has been marked, you can float your cursor over its position in the canvas, and a small arrow appears — clicking this arrow draws a new instance of the object. Using settings in the Marker palette, you can choose to remember or ignore certain attributes such as color. The MultiMarkers tool enables you to draw all marked objects as a single group, transform each individually, and even convert the entire group to a single 3D mesh. Mark the current 3D object. The current 3D object is the most recently drawn object – it doesn’t have to be in Edit mode. Unmark the selected marker. To select a marker, move the cursor over the object until the gray marker arrow appears, then to unmarker press this button or Ctrl+M on the keyboard. The Markers On/Off button activates all markers, or de-activates them without deleting them. Press the Reorder Markers button reverse the order of markers chosen. Press the Delete All Markers button to clear all markers. With Show Markers pressed, markers are displayed in the canvas when your cursor floats near them. Markers are shown as small arrows, pointing in the direction of the object’s orientation when marked. You can clear all items in a layer, and markers will remain in the canvas. Click any marker to recall certain marked information, determined by the rest of the buttons in this palette. With Recall Tool pressed, clicking a marker selects and draws the tool in effect when this marker was first placed. If this button is un-pressed, the currently-selected tool is drawn in its place, and if possible, drawn in the marked orientation and size. With Recall Draw Mode pressed, clicking a marker draws using the selected Draw modes in effect when this marker was first placed. Draw modes recalled are MRGB/RGB/M and ZADD/ZSUB/ZCUT. RGB Intensity and Z Intensity are not recalled. If this button is un-pressed, the current Draw modes remain in effect when clicking on the marker. With Recall Position pressed, clicking a marker draws using the selected X, Y and Z position when the marker was first placed. With Recall Normal pressed, clicking a marker draws using the object’s orientation when this marker was first placed (unless the newly-drawn tool is not a 3D object). If this button is un-pressed, the standard rules apply when drawing a new object — it is aligned to the canvas or other surface beneath it. With Recall Color pressed, clicking a marker draws using the selected color in effect when this marker was first placed. If this button is un-pressed, the new item is drawn using the current color. With Recall Material pressed, clicking a marker draws using the material selected when this marker was first placed. If this button is un-pressed, the new item is drawn using the current material. With Recall Texture pressed, clicking a marker draws using the texture selected when this marker was first placed. If this button is un-pressed, the new item is drawn using the current texture.